# Engine Tune-Up and Maintenance. # 5VZ-FE and 1GR-FE V6 Engine Maintenance and Rebuild. # 3RZ-F and 3RZ-FE Engine Maintenance and Rebuild. # 1KZ-T Engine Maintenance and Rebuild. # Petrol / Gasoline E.F.I. Fuel System. # Diesel Fuel System Including ECD Diesel (1KZ-TE). 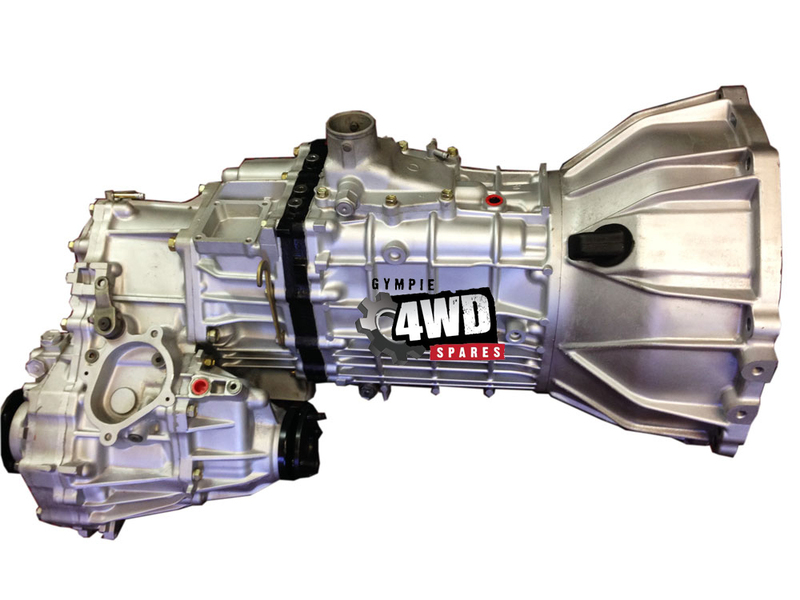 # Manual Transmissions - G52, W56 and R150F Series Manual Transmissions. # Automatic Transmission A343F and A340F. # Drive / Tail Shaft and Universal Joints and CV Drive Shafts. # Axle Assemblies and Differentials. # Windscreen Wipers and Washers. # Heating and Air Conditioner System. # ABS and Speed Sensor Fault Diagnosis and ABS ECU Information. 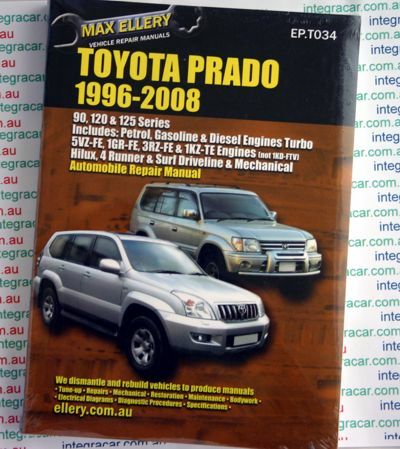 This comprehensive manual covers the complete Toyota Prado range of vehicles. Detailed engine chapters covering all petrol/gasoline and diesel engines. It also covers the Hilux, 4 Runner and Surf mechanicals. Detailed comprehensive chapters cover the complete range of transmissions. The manual also covers all other aspects of the vehicle from changing a light globe through to complete vehicle pull down. Comprehensive chapters covering diagnostics and troubleshooting and also includes complete electrical wiring diagrams for the entire vehicle. This comprehensive manual consists of over 500 pages of step by step instructions which will suite the DIY handyman through to the professional mechanic. Toyota Land Cruiser Prado try a mid-size four-wheel drive vehicle in Toyota Land Cruiser range. It really is made by the Japanese vehicles manufacturer, Toyota Motor organization. The Prado is just one of the modest cars in range. The 2014 Prado is dependent on Toyota's J150 system. The Prado may also be described as Land Cruiser LC70, LC90, LC120, and LC150 with respect to the system. In the united states, the Prado it is really not the main Land Cruiser number; the Toyota 4Runner replaces the Prado with basic trim whilst the rebadged Lexus GX consumes the Prado's position in luxury trim. The GX uses virtually identical human anatomy panels and V8 engine. Prados posses ladder structures, two-speed transfer boxes and backside ray axles. The J70 platform has a front beam axle as the J90, J120, and J150 systems need front side independent suspension. Since 2014, the LC Prado will come in every Toyota market, except, the US, Canada (both available as Lexus GX), Mexico, and South Korea. The Lexus GX was an extra mid-size athletics utility car (SUV) marketed in united states and Eurasian markets by Lexus. Title GX means Grand Crossover. Lexus introduced the very first generation, known as the GX 470 in 2002, and later became the next SUV to enter the Lexus lineup. A five-speed automated was always standard, as had been a full-time four-wheel-drive system with low-range gearing. The 4.7-liter V8 motor when you look at the GX 470 had been just like utilized on the bigger LX 470. The firm next launched the second generation model during 2009. Today badged GX 460 to reflect the change to a 4.6-liter V8 engine, Lexus later on released a lowered displacement GX 400 in 2012 for the Chinese marketplace, with a 4.0-liter V6 engine. Inside Lexus lineup, the GX is situated between its crossover counterpart, the RX, and also the premiums full-size LX. All GX manufacturing features occurred within Tahara plant in Japan, alongside the Toyota Land Cruiser Prado. In fact, both generations for the GX have-been greatly on the basis of the Prado, with updated frontal styling to better integrate using Lexus design language. In other places, the adjustment is less prominent and primarily restricted to small trimmings, including wheels and taillamp lenses inserts. Inside, the first generation inside mostly mirrors that of the Toyota-badged version, but also for the second generation, the interior happens to be further individualised with less provided componentry. The Toyota 4Runner are a mid-size recreation energy car (SUV) generated by the Japanese producer Toyota and marketed throughout the world from 1984 presenting. In Japan it absolutely was referred to as Toyota Hilux search . The initial 4Runner was a compact SUV and bit more than a Toyota pickup truck with a fiberglass layer throughout the sleep, although model has since undergone considerable separate developing into a cross between a concise and a mid-size SUV. All 4Runners have been built at Toyota's Tahara plant at Tahara, Aichi, Japan, or at Hino Motors' Hamura, Japan plant, plus in Brazil. Their mid-size crossover SUV counterpart is the Toyota Highlander. Hilux Surf models in Japan are extensively exported because utilized motors to Somalia, Pakistan, Afghanistan, United Kingdom, Ireland, New Zealand, and Australia. For Southeast Asia the Hilux search had been replaced in 2005 because of the comparable Fortuner, which will be based on the Hilux system. By 2014, the 4Runner comes into the U.S., Canada, Central America, Bahamas, Ecuador, Peru, and Chile. The 4Runner arrived in at # 3 in a 2016 research by iSeeCars.com ranking the very best 10 longest-lasting vehicles. The 4Runner had 5.2per cent of motors over 200,000 miles, in line with the iSeeCars study. In-may 1996, the J70 series underwent a makeover and appeared since the J90 series Prado, an independent series. The human body is lengthened. The style stayed moderate task, such as the J70. The leading suspension system is replaced with an unbiased design, shared with Tacoma and Hilux search, created by Hino. The J90 is produced by Tahara Plant, offered as a three-door short wheelbase and five-door very long wheelbase variation. In Japan, the 3-door series started with a R in the show including RZ, RX, RS to RJ as the 5-door line-up going with T in series ranging from TZ, TX, TS, to TJ. All products was included with front dual wishbone and 4 connected suspension system and full time 4WD. abdominal muscles and a Field track showing altimeter, thermometer and stress had been standard in every the brands. The area monitor wasn't available as standard products in Southern Africa. Television show and audio ready is recommended. Fuel machines included the 2.7 L (2693 cc) 3RZ-FE and, latest in Prado models, the 3.4 L (3378 cc) V6 5VZ-FE. Diesel machines were the 2.8 L (2776 cc) 3L engine, the 3.0 L (2986 cc) 5L system additionally the 3.0 L (2982 cc) 1KZ-TE. There is additionally an extravagance version of the J90, labeled as the Challenger. Options that come with the Challenger were standard leather-based chairs and timber regarding dash. By Summer 1999, lesser adjustment had been made. To be able to follow newer guidelines, fog-lamps had been added to the bumper, except in Southern Africa. In July 2000, a fresh diesel system, the 3.0 L (2982 cc) typical Rail Diesel Injection (D-4D) 1KD-FTV was launched into this design. To reduce thieves, an engine immobilizer ended up being readily available. TX restricted with 8 seating put TX base with roof train, back under mirror, timber panel finish, armrest, optitron meter, base air conditioning including rear heater was introduced into this show. The Prado is assembled by Sofasa in Colombia from 1999 until 2009 without considerable modifications. There have been two versions, a 3-door with a 2.7 L motor and 5-door with a 3.4 L V6 motor with either a 5-speed guide or a 4-speed automated. Between 2005 and 2009 they provided an optional armoured form of the 5-door version. Whenever Prado was launched in the united kingdom in 1996, it was labeled as the Land Cruiser Colorado and changed the 4Runner, which was stopped from sale. It had been labeled as this to tell apart they from the larger Land Cruiser -- renamed because the Land Cruiser Amazon -- which was currently for sale. It dropped the Colorado name tag in 2003, when it was renamed just Land Cruiser. Within the Republic of Ireland many Land Cruisers are sold as commercials utilizing the side house windows and seats eliminated for income tax factors. A multi-link suspension system is a type of car suspension system build typically used in independent suspensions, utilizing three or more horizontal hands, plus one or even more longitudinal hands. A wider definition views any independent suspensions creating three controls hyperlinks or even more multi-link suspensions. These hands don't need to become of equal length, and may be angled far from their particular "obvious" way. It had been first introduced when you look at the late sixties regarding the Mercedes-Benz C111. and soon after to their W201 and W124 series,. Typically each supply has a spherical joint (ball joint) or rubberized bushing at each end. Consequently, they answer plenty along their very own size, in stress and compression, although not in bending. Some multi-links do make use of a trailing supply or wishbone, which has two bushings at one end. On a front suspension among lateral hands was replaced by the tie-rod, which links the rack or steering container on wheel hub. To be able to simplify understanding, its typical to consider the big event associated with the hands in all of three orthogonal planes. For a solid axle automobile the multi connect suspension system provides control of the axle during suspension biking also to discover the axle beneath the automobile. The most frequent is the four connect with panhard bar. That is present numerous automobiles and pickups. The four link can also be used heavily in off-road race and pull rushing. The four link for a good axle features a few modifications including the triangulated four connect and double triangulated four link. Although typical in off-road vehicles they're not frequently located on the road. Solenoid or piezoelectric valves making possible good electric control over the gasoline injections time and amount, and the greater force that the common rail technologies makes available provides much better fuel atomisation. To reduce system sound, the engine's electric controls product can inject a small amount of diesel right before the key injections celebration ("pilot" injection), hence reducing their explosiveness and vibration, and optimising shot time and amount for variants in gasoline quality, cool starting an such like. Some advanced common rail gasoline methods play up to five treatments per stroke. Popular railway motors require a really quick (< 10 moments) to no heating-up time, according to background temperature, and emit lower engine noise and emissions than older methods. These were cam driven, and injection pressure had been proportional to engine speeds. This typically designed the greatest injections stress could only be accomplished at finest system speed therefore the optimum achievable injections stress decreased as engine speeds decreased. This partnership does work with pumps, also those utilized on typical rail systems. With device or distributor systems, the injection force try associated with the instantaneous stress of a single pumping occasion without accumulator, and thus the relationship is much more prominent and problematic. These people were brief when you look at the quantity and time of injection activities that would be commanded during just one combustion celebration. While numerous shot occasions were feasible by using these older methods, its way more harder and costly to accomplish. For the typical distributor/inline program, the beginning of shot took place at a pre-determined force (also known as: pop music force) and finished at a pre-determined stress. This characteristic lead from "dummy" injectors inside cylinder head which exposed and closed at pressures decided by the spring preload applied to the plunger in the injector. When the force when you look at the injector reached a pre-determined amount, the plunger would carry and injections would begin. In accordance train methods, a high-pressure pump shops a reservoir of gasoline at high-pressure --- as much as and above 2,000 bars (200 MPa; 29,000 psi). The term "common railway" is the proven fact that most of the gas injectors become furnished by a typical fuel train which will be simply a pressure accumulator where in fact the gas are stored at ruthless. This accumulator supplies several gasoline injectors with high-pressure fuel. This simplifies the objective of the high-pressure pump for the reason that they only must uphold a commanded pressure at a target (either mechanically or electronically influenced). The gasoline injectors are typically ECU-controlled. As soon as the gasoline injectors is electrically triggered, a hydraulic device (composed of a nozzle and plunger) is mechanically or hydraulically unsealed and fuel was dispersed into the cylinders at the desired force. Since the gasoline pressure energy sources are kept from another location additionally the injectors tend to be electrically actuated, the injections stress from the beginning and end of injections is quite nearby the force into the accumulator (railway), therefore creating a square injections rates. In the event that accumulator, pump and plumbing work become size precisely, the injection force and speed will be the exact same for every of numerous shot activities. Appearing in 2002, the 3rd generation Prado features revised front suspension system to improve dependability. Developing started in 1997 and build work in 1998, utilizing the winning proposition from Lance Scott of the Toyota ED2 design studio in France in late 1999. Engines include the 2.7 L (2693 cc) straight-4 3RZ-FE, 3.4 L (3378 cc) V-6 5VZ-FE and 3.0 L (2982 cc) straight-4 Turbo diesel 1KZ-TE. In countries like China, a newly developed motor 1GR-FE V6 can be acquired. The engine immobilizer became standard gear in certain markets. In August 2004, the 3RZ-FE motor was replaced by 2.7 L (2694 cc) 2TR-FE motor plus in July of the same year, the 5VZ-FE motor had been replaced by 4.0 L (3955 cc) V6 1GR-FE system with 5-speed automated transmission for sale in late 2005. In united states, this design is recognized as the Lexus GX 470 using 4.7 L (4663 cc) V8 2UZ-FE motor. Diesel designs experienced the 1KZ-TE turbo diesel engine with maximum production rating 96 kW (131 PS; 129 hp) plus the 5L-E natural aspirated diesel engine score 70 kW (95 PS; 94 hp). In November 2006, Toyota introduced the 1KD-FTV Turbo Diesel (D-4D engine to meet Euro IV emission criteria. This system provides 127 kW (173 PS; 170 hp) of energy and 410 N*m (300 lb*ft) of torque. The update on D-4D engine has also been matched with transmission updates toward diesel range, aided by the 5-speed automatic and 6-speed handbook transmissions included good petrol operated number. From August 2007 the Prado got several equipment and safety upgrades. The automobile have won 3 prizes for top results on a SUV means vehicle in Australia and United States. The 120-series secure Cruiser Prado shares equivalent suspension system parts whilst the current generation Hilux Surf/4Runner and FJ Cruiser. Discover a smaller three door version of the 120-series, with a 125-code as opposed to 120. Engines are the same, most features are identical; simply the 1KZ-TE was just for sale in five door version. The three home wagon qualities just two chair rows. The gas container is limited to 87 L, no sub-fuel-tank program offered. For design seasons 2007 on Japanese products just, G-BOOK, a registration telematics services, exists as a choice. In China, Dadi car made a clone associated with the suv called the Dadi Shuttle. Japan Prado contained 6 trim amounts known as Gx, Tx, Tz, Tx restricted, Tzg and Tz restricted. The highest requirements model generally Tz restricted contains functions like forward driver and passenger heated seating, heated external mirrors, flexible air suspension, hill start aid control downhill assist controls, main differential lock and sometimes engine auto warming. The 3RZ-FE try a 2.7 L (2,693 cc) variation. Bore is 95 mm and stroke is 95 mm. Compression ratio is 9.5 to 1. Output was 150 hp (112 kW) at 4800 RPM with 177 lb*ft (240 N*m) of torque at 4000 RPM. This engine features twin, chain-driven stability shafts. It offers four valves per cylinder and DOHC. Device modifications is by shim over bucket. First showing up in 2000, the 1KD-FTV is amongst the latest motors built by Toyota. The 1KD-FTV is a 3.0L (2982cc) straight-4 common rail diesel motor with an adjustable geometry turbocharger and Intercooler. This has 16 valves and a DOHC (dual expense camshaft) design. Bore are 96 mm and swing is 103 mm. It makes 172.72 hp (127 kW) at 3400 rpm, and 260 lbf*ft (352 N*m) of torque at 1800-3400 rpm based on target audience and emission specs. In certain areas, outputs were 127kW/410Nm and 140kW/420Nm. Redline of the system reaches 4200 RPM. Compression ratio was 17.9:1. This engine makes use of Toyota's D-4D typical railway fuel shot technology running at extremely highest pressures of up to 135 mpa (1350 club or just around 19,580 psi) which can be about 8 circumstances above the stress of mainstream gas injection techniques within a "common railway" that feeds the injectors on all cylinders. This can be along with a 32-bit ECU which controls gasoline quantity, valve-timing, and boost pressure at different system variables resulting in better fuel economy and in addition full utilization of power during speed. Pilot injection can be utilized by the normal rail gasoline system to smooth system operation. Small amounts of gasoline are introduced to the burning chamber before the main injection celebration, reducing lag time and marketing most constant and total combustion. Outdoor and interior engine sounds can be paid off. The 1KD engine brings 17% more power with 11percent less gasoline usage than their predecessor, the 1KZ engine. This engine was found in Toyota Land Cruiser Prado, 3rd Generation Hilux Surf now found in the Toyota Fortuner, Hiace and Toyota Hilux. The fourth generation is available in some markets since October 2009. There are two main base variants, five-door and three-door. The five door variant in basic marketplace is available in TXL & VXL grades -- which are far more alternative loaded. This generation of Prado qualities advanced level 4WD and a myriad of electronic devices. This generation for the Prado is offered in the US badged as the 2010 design seasons Lexus GX 460 with luxury trim. Depending on the markets, the 4th generation is available with an under-floor mounted or rear home installed free wheel. As an example, UK motors have the spare wheel-mounted underneath the floor, while in Australia and Argentina the extra wheel was mounted on the rear home, leaving area for an auxiliary fuel container, that is desirable in region where lengthy journeys in remote areas is required. The gas capability of double tank series four is 150 L versus 179 L of the series three. The removable third line three-seaters regarding the J120 were changed by fold-into-floor chairs which seat best two different people -- that will be in addition in charge of a loss of cargo ability, the reduction in double fuel capability and functional height within the cargo area. In the upper end VX and Kakadu products, you will find six camera roles enabling viewing to the front and down, to the side both front and back, and the trunk. The system remained the exact same, although the automated gear modification things had been modified for optimum gas economy rather than optimum performance, even yet in activities mode. The fourth generation Prado was launched in Australia on 16 November 2009. Five-door versions range from the GX, GXL, VX, together with high-end Kakadu. The height design, launched in 2012, are priced between your GXL and VX, and it has satellite navigation, two way moon roofing, fabric accented trim, and 7" Fujitsu-Ten touch-screen/multimedia center. Three-door shorter wheelbase products include the SX and ZR. In late 2013, Toyota dropped the badly selling 2-door Prado variants. 2013 in addition spotted a refresh, with an increase of standard equipment, new front panels, and newer headlights. Higher specification systems received Light-emitting Diode headlights and suspension system modifications. Unlike in Japan, Toyota Australia retained the 4.0L V6 power unit (Model: GRL150R) the midlife facelift in Summer 2015, the ability output has increased 5 kW to 207 kW (281 PS; 278 hp) and 381 N*m (281 lb*ft) of torque. All GXL design gotten a 7" Sat-nav as standard. The 1GR-FE may be the 4.0 L (3956 cc) version, created for longitudinal installation in RWD and 4WD pickup programs. It's a 94 mm bore and a stroke of 95 mm. Output try 236 hp (176 kW) at 5200 rpm with 266 lb*ft (361 N*m) of torque at 4000 rpm on 87 octane, and 239 hp (178 kW) at 5200 rpm with 278 lb*ft (377 N*m) at 3700 rpm on 91 octane. This system features Toyota's VVT-i, adjustable valve timing system regarding consumption cam and a compression proportion of 10.0:1. Provider pounds, including fluids, was 166 kg (366 pound). an up-to-date version of this engine features Dual VVT-i, increasing result to 270 hp (201 kW) and 278 lb*ft (377 N*m) on 87 octane and 285 hp (213 kW) and 289 lb*ft (392 N*m) on 91 octane. Around, the 1GR makes use of a "taper-squish" combustion chamber design with coordinating pistons to enhance anti-knocking and motor results, whilst enhancing intake and supply efficiency. Toyota used a siamese-type intake slot, which decreases the outer lining section of the interface wall space and stops gas from sticking with such walls. This motor has actually special cast-iron cylinder liners throw to the block, which are a spiny type to improve adhesion amongst the liner and cylinder block. With your special thin liners it's impossible to bore the block. In the event of cylinder wall surface damage (scoring, deep protrusions, etc. ), the whole cylinder block should be changed. For enhanced block rigidity, the 1GR in addition obtains a higher temperature synthetic insulator/protector, which fills the vacant area between the external portion of the cylinders and block product common to open deck motors. For enhanced soothing efficiency, the 1GR employs liquid passages amongst the bores of this motor. There are two such passages per lender for an overall total of four. This reduces cylinder hot-spotting and keeps combustion chamber conditions much more uniform. A bolt-on TRD supercharger kit had been available on the Tacoma and FJ Cruiser but has-been stopped by Toyota. Venture with Toyota Prado, Toyota's refined, elegant and comfortable SUV. Choose your Toyota Prado, Accessories and View the Gallery. Used TOYOTA PRADO for sale - Browse for used TOYOTA PRADO for sale on Auto Trader, South Africa's biggest provider for used TOYOTA PRADO cars. Buy your ideal car today. Toyota Land Cruiser Prado is a mid-size four-wheel drive vehicle in the Toyota Land Cruiser range. It is produced by the Japanese car maker, Toyota Motor Corporation. Find accurate Toyota Land Cruiser Prado Price in India - Rs 88.8 Lakh. Read unbiased Expert Review and User Review. Get Mileage, Pictures, Colors, Specifications. The 120-series Land Cruiser Prado shares the same suspension parts as the current generation Hilux Surf/4Runner and FJ Cruiser. Diesel Engines Covered: * 4.0 litre "2H" 6 Cylinder OHV Indirect Injection * 4.0 litre "12H-T" 6 Cylinder OHV Direct Injection Turbocharged * 4.2 litre "1HZ" 6 Cylinder SOHC * 4.2 litre "1HD-T" 6 Cinderyl SOHC Direct Turbocharged * 4.2 litre "1HD-FT" 6 Cylinder SOHC Direct Turbo 24v.